When you pick it up, the first thing you notice about the D40 is its size. It's one of the smallest digital SLRs available today. The camera itself is beautifully designed. 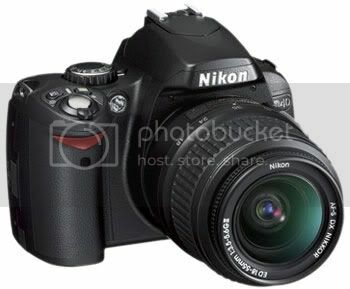 It's probably one of the most appealing digital SLR cameras to look at. Even though looks don't count for much, I find it to be better looking and better proportioned than its competitors, including the Pentax K100D, and the Canon 400D. It has nice rounded sides, an uncluttered look, and a very nice “crinkle” style finish. The Canon has shiny, texture-less black plastic. The build quality also surprisingly good. It has a nice “dense” feel to it. The camera, thanks to its uncluttered, well-proportioned look, appeals strongly to beginners. For some though, it may feel a little too small. Especially if you have big hands. Also, the small size can also mean that changing some settings can be a little fiddly. The grip is extremely comfortable, it's really easy to hold and shoot with. Miles better than the EOS 400D. It has a carefully sculpted rear thumb hook, and your thumb rests, perfectly positioned to operate the rear command dial, the AE-L/AF-L button, and the mode dial, as well as the 4-way navigation controller on the back. The shutter button is well placed, and I've always been a fan of the on/off switch around the shutter.. The only downside is that, because of its compact size, your pinkie finger tends to curl round the bottom of the camera, not stay put on the grip.